December 23, 2010 - Red-eyed tree frog exchanging hands Took a bus to Hotel Si co mono. Outside the hotel is Fincas Naturales, a butterfly garden & amphibian garden. While the butterflies are diurnal, the amphibians are nocturnal.We spent an hour with the butterflies, and then took off for a tour of Quepos. On the way, we had 4 glasses of naturales juices of Pineapple & Mango & Papaya. So much for Quepos. We then returned to Fincas Naturales for a 5:30pm jungle walk. Did we mention the sun sets here by 5:00 pm ? So the group, 8 of us & the guide, with a flashlight per person, trooped out into the wild. We spotted a bunch of spiders, lizards, tadpoles, grasshoppers, and finally the frogs. 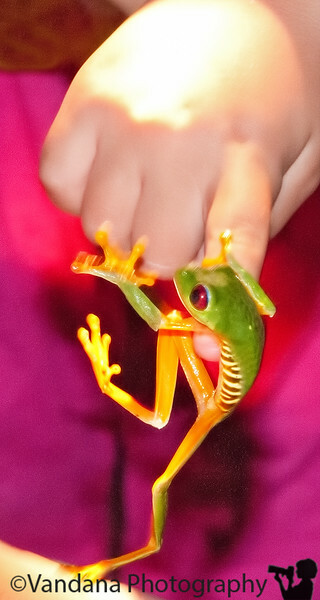 Our guide spotted the red eyed tree frog upon a banana leaf and grabbed it. He then gave it to a little kid in our group, a 5-year old who was so looking forward to seeing the frog. After holding on to the frog for about a minute, she was scared & threw him away! The frog was never to be found again! That's the coolest of cool shots Vandana!!!!!!!!!!! Outstanding. Cute story.. :-) Terrific shot, such awesome colours! Neat capture - great colors!